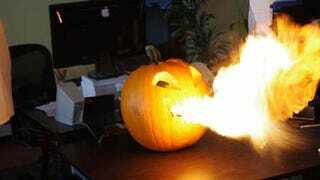 There's no shortage of insane and awesome Jack-O'-Lanterns this time of year, but this is the first we've seen that shoots fire out of its mouth via a remote controlled flame thrower. Instructables user randofo has a guide on how to make your own. 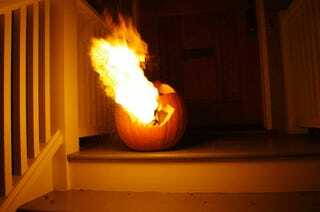 The instructions are broken up into two helpful sections: "For the Jack-O'-Lantern" and "For the remote controlled flame thrower." Your guess which is more intensive. You'll need some circuitry and Arduino knowhow, but the guide is pretty thorough. So if you can track down the components (a small motor, some WD-40, blatant disregard for city ordinances) you'll probably be fine. You know, so long as "fine" doesn't include a guarantee that you won't accidentally set yourself or visiting tick-or-treeters on fire with a flamethrower in a pumpkin.